John Taylor captained Gloucester in 1953-54, in what was then their most successful season. He was a talented winger who played 101 games for the club from 1951-54, scoring 39 tries. He also played for Lydney, Bristol University and UAU before joining Gloucester, and for Leicester after leaving the club. He was a regular first choice for Gloucestershire throughout much of his career and played for Western Counties against the 1953-54 All Blacks. John Edward Taylor was born on 14 October 1926. He attended Lydney Grammar School where he learnt his rugby.His first game at Kingsholm, on 13 January 1945, was a trial for the Gloucestershire ATC team who were to play Cornwall ATC in Camborne later that season. John was selected for the game at Camborne where he scored the only try in an 8-6 win. While at Bristol University from 1948-51 he captained the university side and took part in two of the annual Universities Athletic Union (UAU) Christmas tours, playing against Gloucester at Kingsholm in December 1950 and 1951. He also played for English Universities against Scottish Universities at Waterloo (21 January 1950) and Welsh Universities at Cardiff ArmsPark (15 February 1950). John Taylor made his County Championship debut for Gloucestershire on 14 October 1950 (his 24th birthday). The Citizen said he was “a star of the match” and “deserving of a trial for England”. He went on to play in the semi-final against East Midlands at Kingsholm and the replay that followed. After graduating from Bristol University, he joined Gloucester and made his 1st XV debut on 13 September 1951 at Stroud. He played against Waterloo, Moseley, Neath, Blackheath and Bristol before the end of the month, attracting extravagant praise from the Citizen. Gloucester went on to a record-breaking season in which Taylor was second in the try-scoring list with 15 tries. He captained Gloucester on several occasions in 1952-53 before becoming club captain the following year. 1953-54 was another outstanding season for the club and for John Taylor personally. The 1952-53 record of 30 wins was broken on the last day of the season and Taylor, leading from the front, was top try scorer with 13. He had been a first choice for Gloucestershire since his debut in 1950 and played for Western Counties against the All Blacks in front of a record crowd of over 20,000 people at the Memorial Ground Bristol on 14 November 1953. His work had taken him to Leicester early in the 1953-54 season and he had spent most of his successful season as captain commuting from Leicester to Gloucester for matches. Inevitably he joined Leicester Tigers the following year and played against the Barbarians at Leicester on December 28 and against Gloucester at Kingsholm on January 9. However he returned regularly to play for Gloucestershire and played throughout the County Championship campaign, as a Leicester player. 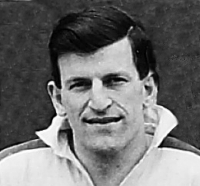 Taylor continued to play for Leicester for the next five seasons, returning to Kingsholm for a single last guest appearance for Gloucester in an Easter bank holiday game against Sale on 22 April 1957. John Taylor became President of Gloucestershire and Chairman of Selectors in 1981-82 and represented Gloucestershire (with J V Smith) on the RFU for a number of years.